Where I can keep track of the special events (note: these are not “parties” as so many people are misled to believe) at Collaborate (April 7-11, 2014 – Las Vegas, Nevada). You’re registered as an Collaborate Attendee. You’re either a prospect, customer, or goodwill contact for the host. You visit the host’s booth at Collaborate in order to pick up whatever is required for entry. Do not just show up at the event and attempt to “crash” it – just spend your time at a regular #C14LV reception the same evening and you’ll still get plenty of party time. Feel free to post your own additions in the comments. Hi, I’m James Lui, a senior applications DBA working at Aramark Uniform Services. and I’m Bobby Curtis, a Solution Architect with BIAS Corporation, Oracle Platinum Partner. [James] We just finished an Introduction to 12c New Features and Functionality. One of the reasons we wanted to bring this to the Users Group’s attention.is that out on the internet, we were Google-ing for the new Database 12c we wanted to find out, it’s not a general release right now; it’s not generally available. But there are Oracle Beta test partners out there looking at it, whacking it and trying to make it work. But what we did find was a little disturbing.There’s a lot of stuff dating back to early last year (2012) that partners that are on these Betas are blogging about features that may or may not be in the product. They’re putting SQL code out there that is wrong. That came to our attention when we were talking with other Oracle Partners out here (at Collaborate). What do we do about this? So our position on this was to try to start elevating the invisibility of what is happening out there with regard to NDA Beta Partners, like Bobby and I, who are are subject to… You can’t talk about it, or you can’t disclose stuff that isn’t real. The feature sets in the final release are subject to what Oracle wants to try to present as a solid product that works to end-user customers. Not something that the wheels are going to fall off.just because they tried it (they put some spinners on it) and it ends up falling off and it’s a bad idea. The whole purpose for this idea is we don’t do GA on an unstable product. Let’s let experts hammer at this thing. See if it works, get an idea from a users group perspective (trying to represent as many people, as possible) what features work, what doesn’t work. and what needs to be fixed before the thing goes live. [Bobby] That way the users understand what they’re really getting versus what the hearsay out there.. Because everything that’s been posted out there (on the blogs) violates the NDAs. and Oracle can pull things (features) out and nobody really knows it because they’re relying on older postings that were not authorized anyway. So this session was to provide the users groups with something based upon here’s what we’ve seen, and here’s what we think is going to be in there, but it’s not guaranteed. [Bobby] Like, 25 of them — the tip of an iceberg on this product. [James] But in terms of what that final product ends up being, when Oracle decides it’s ready for market, we had the confidence as users group representatives (ODTUG, IOUG, UKOUG, Australia OUG) when we hammered it to death, these features worked, with the caveat of saying “Fix this ” then we’re (users groups) happy. That’s the idea behind this session. Telling people that going forward, you may need to go back to the drawing board or to school to find out how to use this product in the best way. But the exciting part is here at Collaborate, IOUG was able to give those who attended our session a preview of the future in a very substantial technical way. [Bobby] And so we thought it would be a good idea, so okay there’s a lot of talk about it, everybody’s asking when’s it coming out, what’s going on? So from a users group perspective, let’s give everyone not so much a peek into it, but to say here’s what’s coming from what we know of, from looking at the Betas. But, again at the same time letting everyone know that just because we say something’s coming, Oracle could pull the plug (on that feature) at some point-in-time and say, “That’s not going to be added in this release. “ So basically, this was a way to give to the users groups, who have been saying, “We’ve been talking about it for six months. But what’s really in it?” And as we alluded to earlier, we’ve only touched the “tip of the iceberg” – we only did 25 of them (the new features). And we didn’t do a Top-10 or anything like that. We just said, here are the 25 features we tested during Beta testing, and here’s what our thoughts are. So we think we gave the users groups a good base of understanding where it’s (Database 12c) coming from, and what can be potentially looked at, and what they could use. And from the reaction we got from the crowd, was actually pretty good. [James] And Bobby represents the partner, implementer, system integrator world of the consultants that are out there who are going to be challenged with actually upgrading (systems), or doing the installations. I represent the existing customer base of Oracle, we’re an Applications e-Business shop; we want to know what does that roadmap affect for us. What does 12c give us to save money basically as an organization? So between the two of us, we actually do cover a big part of that world. and we were very heartened by the (experiences) during the Beta testing (we were Phase 3, probably the last (Beta) before General Availability), we’re pretty happy with the product. Perhaps, shockingly good? [Bobby] Any time you get a (Database) developer standing behind your shoulder… because that was one of the really impressive things behind the Beta testing. You had 9 testers, and Oracle put 50 of their people in the room with us. and when we broke it, they literally pulled the code open and looked at it and said, “Here’s why it’s broken.” And that in-turn gave Oracle the insight to say, “Okay what did you guys do?” versus “How did it break?” So that way they can go fix the code and can be more responsive to what users are going to do out in the marketplace. [James] And while it’s not a generally-accepted practice, nor a best practice idea, I as an e-Business Suite Customer ended up bringing in a live R12.1.3 version instance. Not certified. Not supposed to be certified. Certainly Oracle’s own (e-Business Suite) Development group behind Applications Technology does not certify you’re supposed to be doing (Database) 12c upgrades. But in the context of a Beta, for me this is the exciting way to do it. You take a sandbox instance, you take a copy of a live R12 instance and you try to do the upgrade. The only things that broke, was the stuff that Oracle told us would break, because they de-support those particular features. That was the guarantee that makes it whole. [Bobby] They listened and they fixed it. So that when GA comes out, you can take it to Production if you want. I think that’s what a lot of people are going to be shocked about, because most organizations wait for Release 2, to be honest. But Release 1 of (Database) 12c, we think, from the user group perspective could be production-ready and be used. [James] That’s better than most other software companies that try to be first to market with a new feature, and let the user community test it and find out where the bugs are. That was a different philosophy that we met (at Oracle). And we know the Beta 1 and Beta 2 release testings uncovered thousands and tens of thousands of problems that got fixed by the time we got our hands on it. The improvements that Oracle has actually made in that process That’s a good step in the right direction, and we would hope every software vendor actually does that same thing. Because IOUG being very agnostic about what the user community needs to make a business solution happen, having Oracle do that just makes their job easier. Denver Colorado Convention Center April 10, 2013 – Thank you to all the attendees, volunteers, sponsors and staff who made this another legendary week of Oracle education for everyone! See you in 2014 – Collaborate 14 – Las Vegas, Nevada April 7-11, 2014 – Venetian Resort and Conference Center. Taped for collaborate.ioug.org by me. Collaborate asked ” What about Database 12c? ” @IOUG is pleased to deliver! In MHB4A 830A Th, Just before you hop on the plane/bus/car/train/buffalo (it’s Denver…) back home, get tuned in, turned on, updated, clarified, ask your what is it questions, bring clarity to the cloud, plug-in, charge-up and get what you travelled all the way here to find out the details about the database formerly-known-as-next-generation (psst…that means “12c”). No,it’s not GA yet (General Availability). Yes, we are both knowledgable Beta participants under NDA. Yes – you need to know more than you do today based upon your experience with even 11gR2. Bring your coffee, munchies and your questions. And prepare for some answers. Finally. You may or may not have visited http://blogs.ioug.org which is powered by stand-alone WordPress. 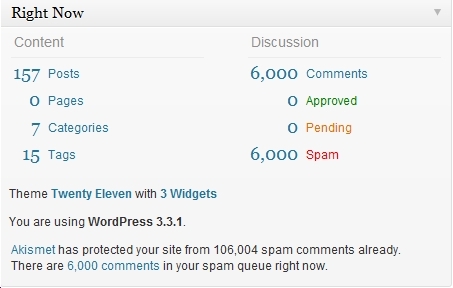 But after learning how WP works with my own blog, I volunteered to start cleaning up the Independent Oracle Users Group’s blog site and low and behold, lots o’ spam. Don’t leave the Comments door open for unregistered users to post automatically-approved comments. 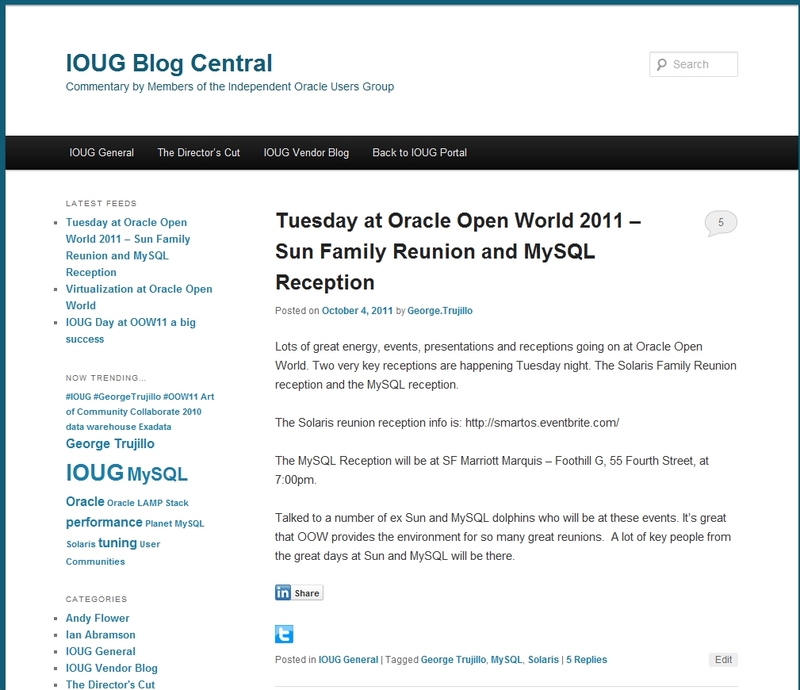 The blog is being re-formatted to adopt the new contemporary IOUG website look-and-feel as well as make it more useful to users. Feel free to leave any feedback you have about what you would like to see on the site, or here.